In the sixth pAsuram, AzhwAr is meditating upon the great quality of emperumAn giving up his supremacy and accepting alms, which is greater than previously enjoyed qualities and the act of mercifully digging out the earth with his ability. Subsequently, AzhwAr mercifully speaks about emperumAn‘s arthithva sAmarthyam (ability to seek alms), where he has lowered his natural quality [supremacy] which is beyond just assuming a humble form. kEttum uNarndhavar kEsavaRkAL anRi AvarO? The generous dhEvas, having suffered by the torment of mahAbali, who has never diminishing magnanimous hand, grouped together, without any enmity between each other, went to emperumAn and surrendered to him through their prayers; eliminating the sorrow in their mind, emperumAn having a hand which acquired beauty due to accepting alms, attracting mahAbali with his vAmana (dwarf) form, performed acts; will those sentient beings who are meditating as if seeing physically, and hearing these acts, become servitor for anyone other than vAmana who is having beautiful locks of hair which are elegantly swaying? 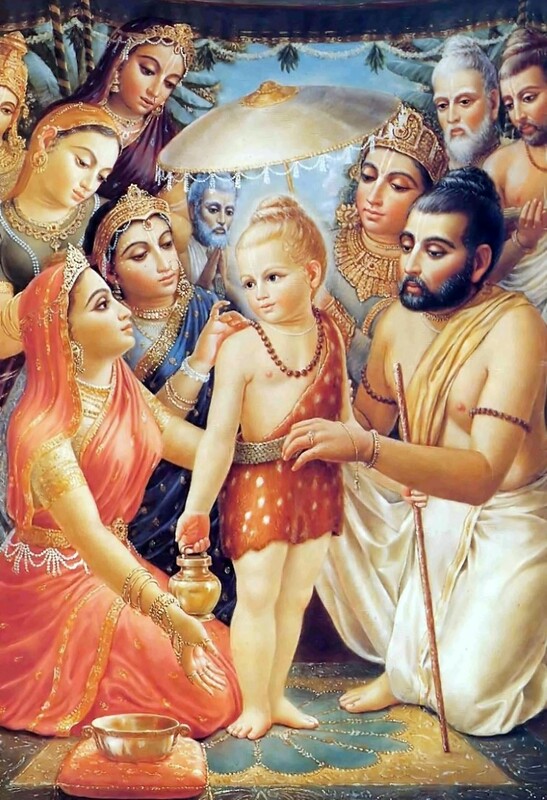 kEsavan (kESava) also means the master of brahmA and rudhra, with one [brahmA] washing his divine feet and the other [rudhra] accepting that holy water on his head. kEttum uNarndhavar – When an AchAryan instructs a meaning, hearing that and remaining with clarity as said in “Evam gyAthvA bhavithum arhathi” (after knowing that, acting accordingly). kEsavaRku AL anRi AvarO – Would they become servitor of anyone other than the one who became the refuge, without letting anyone else to be the refuge? kESava means as in mahAbhAratham harivamSam “ka ithi brahmaNO nAma ISOham sarva dhEhinAm | AvAm thavAngE sambhUthau thasmAth kESava nAmavAn ||” (both of us, brahmA (ka) and rudhra (ISa), originated from the divine body of your highness; thus you are called kESava” and due to having beautiful locks. vAttam ilA vaN kai – Instead of giving and withdrawing after sometime, the hand which keeps giving. emperumAn did not severe his [mahAbali’s] head like he did to rAvaNa et al since there is a reason [of mahAbali being magnanimous]. mAvali vAdhikka vAdhippuNdu – Having this [magnanimity] as the reason, he tormented the dhEvas and they suffered. Ittam koL dhEvargaL – Like village-heads, they will not tolerate one another’s greatness, and are of the nature that one person [rudhra] severs another person’s head and another person [brahmA] has his head severed; as great danger loomed, such envious people gave up their pride, came together and fell at the divine feet of emperumAn. senRu irandhArkku idar nIkkiya – [reason for “senRu” – they went to emperumAn, is explained here] When maNiyakArar (administrative chief) is in the temple, he would think “what is wrong if the ISvaran (lord) himself has to come to me?”; similarly, these dhEvas think “everyone should come to us”, but the great danger which was looming, made them unite and come here – thinking like this in his divine heart, emperumAn eliminated their sorrow. [Would the dhEvas think like that?] When emperumAn broke a weak bow, the dhEvas thought him to be great as said in SrI rAmAyaNam bAla kANdam 75.19 “adhikam mE nirE vishNum” (they thought vishNu to be superior to rudhra); at other times they remain as said in SrI bhagavath gIthA 16-14 “ISvarOham” (I am the controller of everything). When such dhEvas come begging, emperumAn eliminated their sorrow. kOttam kai vAmananAy – Having beautifully cupped hands to accept the water; as said in nAchchiyAr thirumozhi 11.5 “pollAk kuRaL uruvAy poRkaiyil nIrERRu” (in the form of a beautiful dwarf, emperumAn accepted water in his golden hands), since mahAbali is troubling the dhEvas, he should be killed; but since he has noble qualities, emperumAn won’t kill him; so, emperumAn, the protector, should find out an apt means to satisfy both situations. poRkai – hand which acquired beauty. Beautiful hand. The hand which grew, by giving; as said in SrI rAmAyaNam yudhdha kANdam 21.7 “gO sahasra pradhAthAram” (the hand which grew, by donating thousands of cows) and in SrI rAmAyaNam sundhara kANdam 33.25 “dhadhyAn na prathigruhNIyAth” (perumAL (SrI rAma) would give but not accept any charity). seydha kUththukkaL kaNdumE – For AzhwAr, his (emperumAn as vAmana) acts of being born on one day, growing up on the same day, setting out to seek alms on the same day, and going all the way to the sacrificial arena of mahAbali, walking in a tense manner to cause disturbance to the earth and entering there, standing there humbly with krishNAjinam (deer skin), yagyOpavIdham (sacred thread) and munji (dharbA grass) and asking childishly “I will accept”, and showing little feet but measuring with huge feet etc appear like dance by expert dancers. In comparison to his simplicity of becoming an alms-seeker while having all the supremacy and being Sriya:pathi (husband of SrI mahAlakshmi), to protect his followers, is protecting the earth from the deluge, a match? This entry was posted in thiruvAimozhi, thiruvAimozhi 7th centum on September 9, 2018 by Sarathy Thothathri.